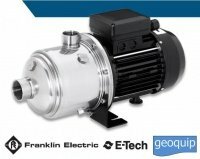 The Franklin Electric E-tech EH Series, EHsp Series, multi-stage booster pump is designed to meet your pressure boosting needs. The stainless steel construction offers high performance in a wide variety of applications. The EH Series is offered in five flow rates and different horsepower sizes in 1-phase or 3-phase to make sure you have the right pump to fit your application. Franklin Electric E-Tech EHsp Horizontal Self-Priming Multistage pump is WRAS approved and features a design innovation of a special elastic valve system allowing air, present in the system, to escape - suction height up to 7 meters in less than 5 minutes. The EH Franklin Electric E-tech, 3 multi-stage booster pump is designed to meet your pressure boosting needs. The stainless steel construction offers high performance in a wide variety of applications. The EH Franklin Electric E-tech, 5 multi-stage booster pump is designed to meet your pressure boosting needs. The stainless steel construction offers high performance in a wide variety of applications. The EH Franklin Electric E-tech, 9 multi-stage booster pump is designed to meet your pressure boosting needs. The stainless steel construction offers high performance in a wide variety of applications. The EH Franklin Electric E-tech, 15 multi-stage booster pump is designed to meet your pressure boosting needs. The stainless steel construction offers high performance in a wide variety of applications. The EH Horizontal Multistage pump from Franklin Electric E-tech with the new inverter device Drive-Tech MINI is an state-of-the-art booster set which combines efficiency, simplicity, innovation and safety. The EH Franklin Electric E-tech, 20 multi-stage booster pump is designed to meet your pressure boosting needs. The stainless steel construction offers high performance in a wide variety of applications.